Bobo is a co-founder of Shoot Raw. Her career, for the most part, has been an evolving blend of design and technology. Bobo grew up in Hong Kong where she began working in the printing industry before moving to graphic design. She then joined the booming desktop publishing industry of the late 80s and early 90s. After this, she had a spell building and designing websites for companies in the Far East. In the mid-nineties, Bobo started working as a Mac support specialist. She provided expertise at software launches and at events such as the Macworld conferences. A position at SWIFT, a banking cooperative, quickly led to international opportunities, as she spent time working at the head office in Brussels as well as the Asia Pacific offices. 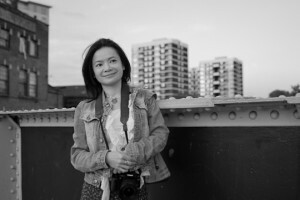 In 2006, she moved to London and has focused mainly on web work and photography since then. Bobo switched from film to digital in the year 2000 as a means of documenting her personal and business travels. Since then, she has expanded her body of work, photographing architecture, landscapes and even origami creations. She sells her work as stock photos, many of which have featured on book covers and websites. She built and helped design the websites for several clients of Shoot Raw, including Carla Capalbo, Nicola Stocken and Paul Unwin. As someone who believes in continuous learning, Bobo has recently been spending her spare time studying topics as diverse as media studies, international development and psychology.